In the age of Twitter-shortened attention spans, fame is an increasingly powerful weapon of diplomacy. John Avlon on how George Clooney is helping to bring change—and a hefty dose of hope—to Sudan. And yet one former “Lost Boy,”—the protagonist of the bestseller What Is the What? —says that the referendum in Sudan would not have happened without the star. “He saved millions of lives. I don’t think he knows this,” says Valentino Achok Deng. Read the full story below. As Hollywood scrambles through the final days of jockeying for Oscars, George Clooney’s attention is far away—9,000 miles away, to be exact. The veteran Academy Award campaigner plans to walk the red carpet and crack open an envelope at Sunday’s ceremonies, but he has no movie in contention. A different drama is on his mind. In January, Clooney was back in South Sudan, directing his star power toward helping its people peacefully achieve independence from the northern government of Khartoum after two decades of civil war. With five years’ involvement in Sudan, Clooney has begun to define a new role for himself: 21st-century celebrity statesman. It’s an ambitious avocation: Clooney has been leveraging his celebrity to get people to care about something more important than celebrity. South Sudan’s January referendum for independence was quickly followed by uprisings that toppled North African and Arab dictatorships, with power moving away from centralized political bureaucracies and toward broader popular engagement. In this new environment—fueled by social networking—fame is a potent commodity that can have more influence on public debate than many elected officials and even some nation-states. 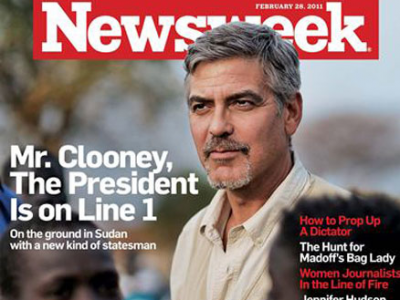 Clooney had traveled to the oil-rich contested region of Abyei on the eve of South Sudan’s historic referendum. When the polls closed seven days later, Africa’s largest nation would be divided into two separate countries by electoral mandate. After witnessing more than 2 million people murdered—including the first genocide of the 21st century, in Darfur—South Sudan would finally be on the path to independence. It was an outcome that even three months earlier appeared unlikely. And Clooney, according to many observers, played a pivotal role. No one in Abyei has seen a George Clooney movie. His credibility here comes from the multiple trips to Africa, many of them with John Prendergast, cofounder of the Enough Project. Amid the factions, Clooney is seen as a man unconstrained by bureaucracy, with access to power and the ability to amplify a village’s voice onto the world stage. Celebrity statesmen function like freelance diplomats, adopting issue experts and studying policy. More pragmatic than stars-turned-social activists in the past, they use the levers of power to solve problems. Clooney has Sudanese rebel leaders on speed dial. He’s had AK-47s shoved in his chest. And when he’s on movie sets, he gets daily Sudan briefings via email. Clooney’s high-wattage visits draw unwelcome attention to the head of the north’s Islamist government in Khartoum, Omar al-Bashir, who has been indicted for war crimes by the International Criminal Court. News of the satellite spurred Khartoum to issue a press release accusing Clooney of “an ulterior motive that has nothing to do with peace.” But to the world media, a press release is no match for the spectacle of Clooney in Africa. Clooney read Kristof’s Darfur columns in 2005. “I had just come out of Oscar season—I had two movies up—and you really do campaign, like kissing babies,” he says. “So by the time it’s over, you sort of feel unclean. You want to do something that makes you feel better.” He remembered how his father, Nick—a newsman from Kentucky—had been furious when international stories were bumped by celebrity gossip. So when he made his first trip to Sudan with his father, Clooney was determined to put the candy coating of celebrity on the serious substance of foreign policy. John Prendergast gets credit and/or blame for popularizing the actor-activist alliance. A former director of African affairs at the National Security Council under President Clinton, Prendergast lopes around sporting sneakers and graying shoulder-length hair. He stumbled on the formula after a trip with Angelina Jolie to the Congo in 2003 drew people’s attention. Prendergast’s partnership with Clooney builds on the template set by U2’s Bono and Jeffrey Sachs of the Earth Institute, who publicized efforts to alleviate extreme African poverty through debt forgiveness and targeted aid while successfully lobbying the Bush administration to expand funding for AIDS drugs. “Bono’s model really worked,” Clooney says. “There is more attention on celebrity than ever before—and there is a use for that besides selling products.” Stars like Brad Pitt (Katrina), Ben Affleck (Congo), and Sean Penn (Haiti) followed suit. “A lot of the young actors I see coming up in the industry are not just involved, but knowledgeable on a subject and then sharing that with fans,” says Clooney. No one’s just a “peace activist” anymore—they have a specialty. Off-camera, Clooney is funny and friendly, frenetic and unpretentious. He’s proud to be “the son of a newsman.” He’s decidedly a guy’s guy—a connoisseur of the practical joke and a rubber-faced raconteur, fueled late into the night by vodka and soda. But Clooney is also the first one up in the morning, needing only four hours of sleep. He gives the impression of someone who takes his work seriously, but not himself. “You cannot sustain people’s attention seven days a week, for a long period of time. Actors have an advantage, because you do a movie and then you disappear for a while,” he says. “That’s what John and I try to do—come back every three or four months with something new to reignite interest.” Then he jokes it might take The Real Housewives of Sudan to keep Americans’ attention. After driving across arid plains dotted with huts and red acacia trees, we pull into a compound guarded by soldiers manning a jeep crowned with a machine gun. Inside a thatched hut, the Abyei administrator, Deng Arop, and the chief of the Ngok Dinka tribe, Kuol Deng, greet Clooney warmly and gesture for the group to sit. “Our job is to ask you how we can help,” Clooney says—and then he listens. Morale is low and tensions are running high with the neighboring nomadic Misseriya tribe, who are considered an ally of the north. There is talk of the Ngok Dinka declaring an independent association with the south, which could spark a new civil war. Over two hours, Clooney and Prendergast counsel calm and promise to communicate Abyei’s concerns to the southern capital of Juba and to Washington. Then Clooney steps outside to find camera crews from CNN and SkyNews. Alerted that he was heading for Abyei, the networks dispatched cameras to an area without pavement or plumbing, 550 miles from the nearest city. We drive on to a “returnee” camp known as Mejak Manyore. There, in a field of mud, are rooms without walls. Bed frames, tables, and chairs are arranged almost as if still inside the houses their owners once inhabited. They belong to a handful of the 40,000 families who left the north and returned home to the south over the past four months in anticipation of independence. Now they are living under the open sky in a no man’s land, surrounded by all their earthly possessions. Barefoot children follow Clooney around, alternately friendly and shy, some carrying visibly sick younger siblings in their arms. “They’ve packed everything up and come here—not out of fear, but out of incredible hope,” Clooney says, surveying the scene. “I’ve been to a lot of refugee camps where people have come because half their family was killed. These people are here because they want to be part of something historic. They believe things are just going to work out.” But two miles away, Misseriya militias attack a Ngok Dinka village that day, killing more than 30 members of the tribe—including police officers—before being repelled and losing more than 80 militiamen themselves. The Republic of South Sudan will not officially become a separate nation until July 9. Obstacles remain, especially Abyei, caught between countries and capable of igniting at any moment. When SatSentinel.org released its first high-resolution photos, it provided visual verification that the north had deployed some 55,000 troops and artillery around the border of Abyei. Whether defensive or offensive, Khartoum could no longer deny the buildup. This entry was posted in Columns, Featured Columns and tagged Newsweek. Bookmark the permalink.